Leave the RUST to us! Rust stains on carpet occur when moisture meets metal that is sitting on your carpet. Furniture sometimes has metal pieces on the bottom of the legs and when they get wet from drink spills, pet urination, water intrusion and the like, an oxidation process occurs and the result is rust stains on your carpet. Spills from watering plants. 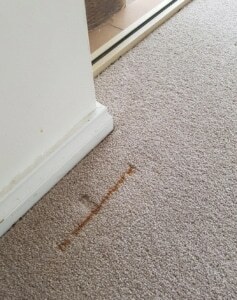 This may possibly be the #1 cause of rust stains on carpet. Water will spill off the plant and run down the metal plant stand and settle onto the carpet creating a rust stain on the carpet. Pet urine on furniture. Another extremely common rust stain problem we see is when the family pet urinates on the leg of the couch or a table and the urine puddles up on the carpet and touches the metal piece on the bottom of the couch or char leg. Improper carpet cleaning. A lot of Splash n Dash carpet cleaners are going to be mad at me for saying this, but not implementing proper dry passes when cleaning carpet, then placing furniture back on that damp carpet is extremely careless and will cause rust stains on carpet nearly every single time. Water damaged carpet. Sometimes accidents occur. Clogged drains, heavy rains and cracks in foundations, burst water heaters or frozen pipes that burst will definitely create a rust stain on the carpet if metal objects aren’t removed in time. In the event that you do notice a rust stain on your carpet, call The Carpet Chemist. We are Louisville, KY’s experienced rust stain removal pros! There’s really nothing you can do to your carpet that we don’t have a solution for. The Carpet Chemist says: Don’t replace your carpet due to a few rust stains. We’re MAD about carpets! We have the solution for rust stain removal. Upload a pic of your rust stains for an instant rust stain removal quote. Our IICRC-certified team provides no-obligation estimates. Connect with our team at (800) 515-1342 or by using the secure form below.